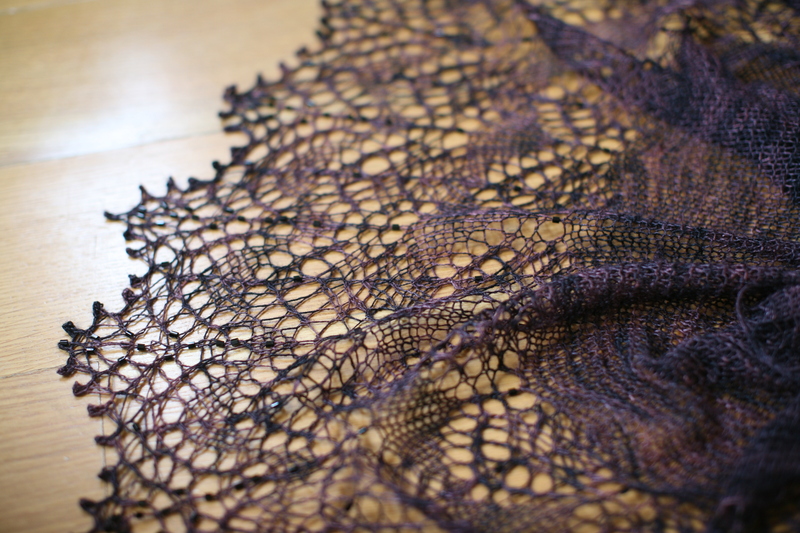 Ravelry is a pretty amazing place. 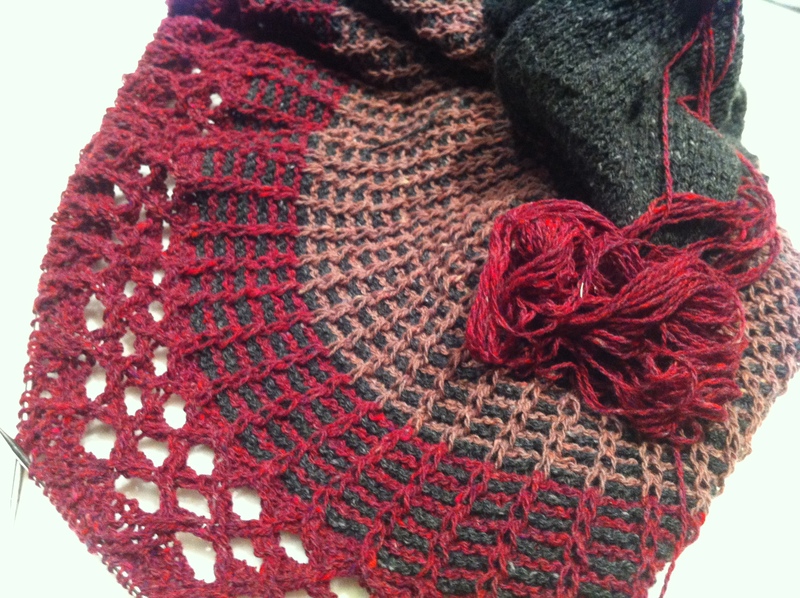 Not only is it an incredible database of patterns and a personal database of all things knitting for me, it is a place where I have “met” some fantastic people. It appears that I am in the middle of an inadvertent KAL (knit along) with one such friend. I cast on Conic, as you know, and my friend Judy (from Ohio, where Finn used to live!) cast on shortly after I did. We have had a nice back and forth online, updating each other on progress and asking each other about opinions on any changes we were contemplating. (That has got to be another blog post — how I think I know better than people who write the pattern and insist on changing it, all the time.) I did not change this pattern at all except to change needle size on the cuff ribbing, but I think Judy must REALLY hate picking up stitches because she was contemplating provisional cast ons on some edges. It’s really nice to have someone cheer you on as you are knitting away on many stitches (>400) on small-ish (US2) needles. 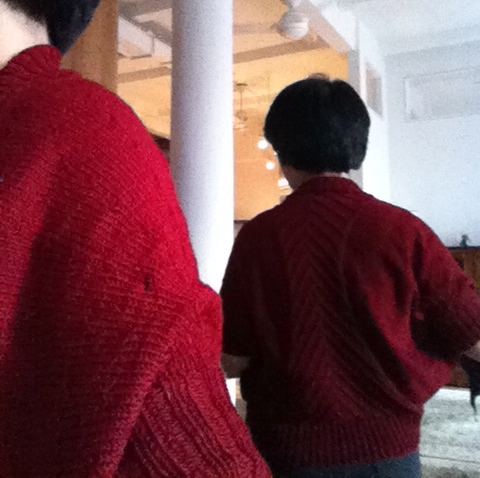 I had the ribbing done in a few days, and I actually wore Conic to work this past Monday! 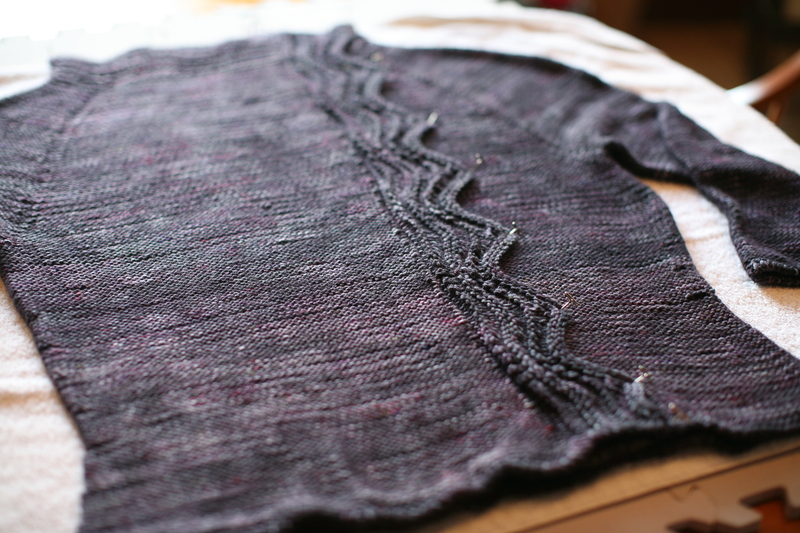 I think Judy is on her last bit of ribbing as well now, and I think she will be able to wear the shrug to work on Friday. 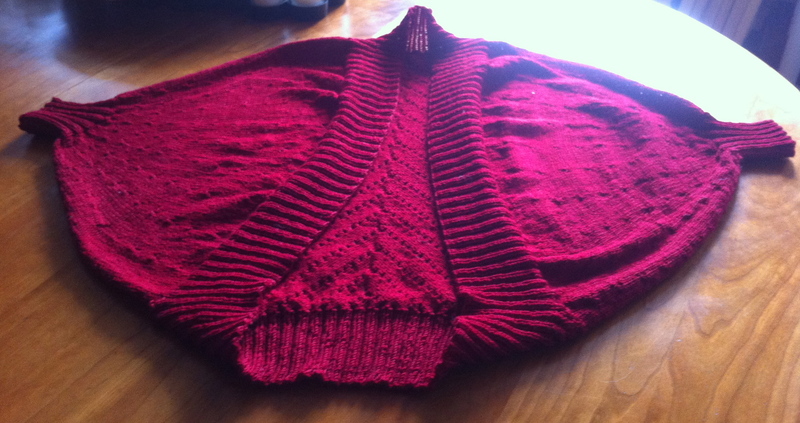 I can’t wait to see the finished object photo of her shrug!! 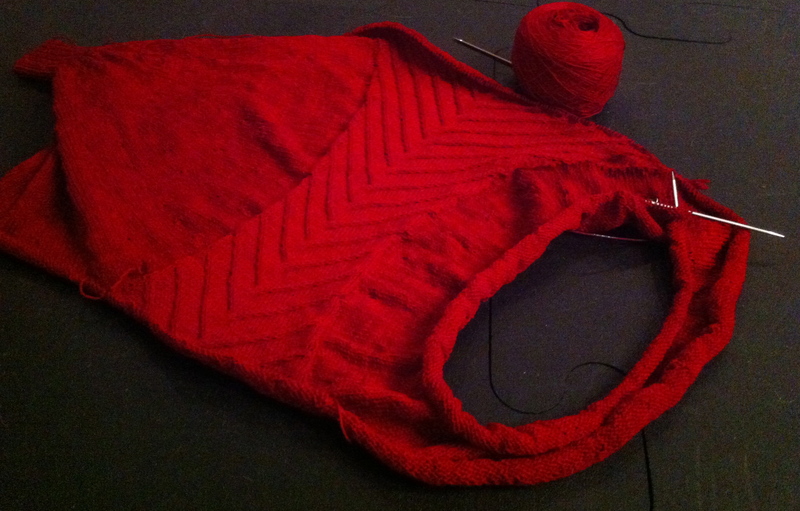 Conic was a really fun knit, and I expected nothing less of Cookie A. She, after all, singlehandedly turned me on to knitting socks. 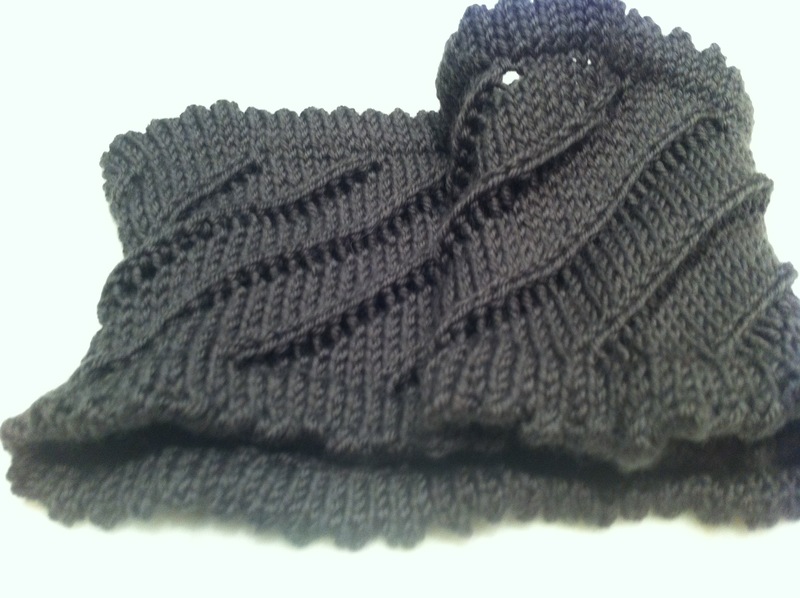 I knit mine out of Wollmeise 100% Merino sock (of course, a sock yarn. So appropriate.) in a deep, almost-cranberry red called Ruby Thursday. The construction is really interesting — you knit the spine down the back, and then do the big dolman sleeves attached to this spine. From a knitting progression perspective, it’s really satisfying because the sleeves get progressively small in big increments — so once you have gone through about 5 sets of decreases, the knitting feels like it flies off the needles. From a wearability standpoint, I thought it sat on my body pretty well. 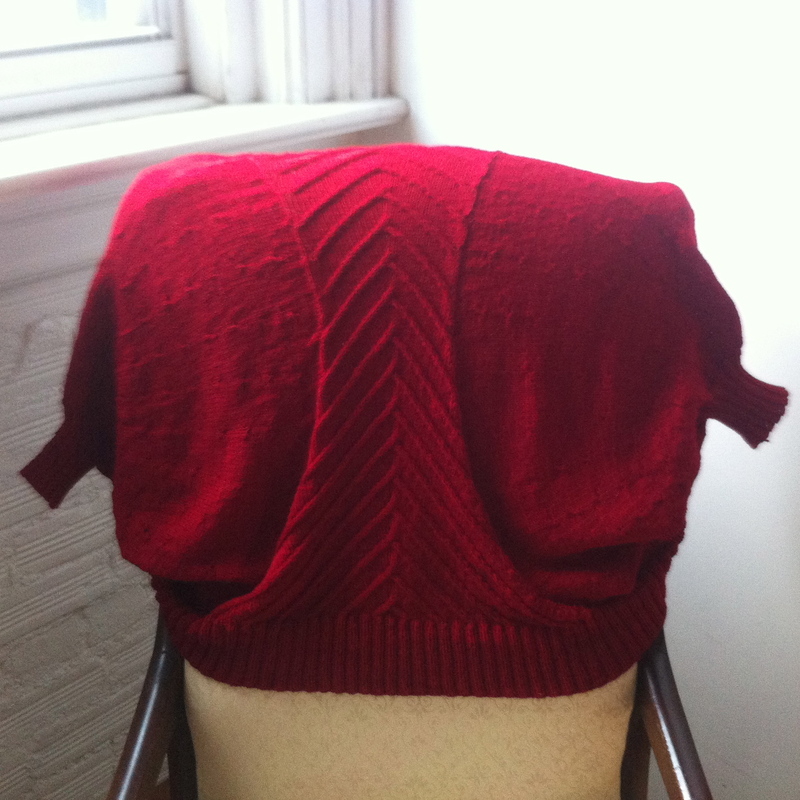 I felt like I kept on tugging on it at the back, but I am not quite used to the shape of this garment — it’s not quite a sweater. By the middle of the day, I was done fiddling with it. I can always knit another! PS WIP Wednesday admission. I’m too busy casting on new projects. But Waterfall is still out on my coffee table, sneering at me.